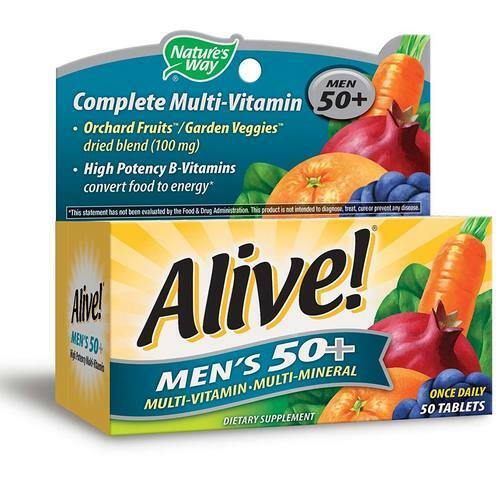 Nature's Way Alive Men's 50+ Multivitamin - Multimineral is made with their orchard fruits and vegetable blend. Warnings: As with any supplement , if you are taking medication consult your doctor before use. Not formulated for use in children. Do not exceed recommended use. Keep out of reach of children. Notes: Does not contain sugar, artificial flavoring and preservatives, corn, dairy products, wheat, grain, yeast. The customer reviews posted below are based on individual consumer experiences and may NOT necessarily represent what expected results will be from using or taking Nature's Way Alive Men's 50+ Multivitamin - Multimineral - 50 tablets. These results may not be typical and you should not necessarily expect to receive the same results. Actual results may vary. I bought this vitamin supplement for my dad three months ago. After two weeks of daily use he told me that he is feeling much more willing for daily activities. Sit with more physical and mental energy. I have also used supplements of this brand and approve for effectiveness and safety.